This simple, small, and stylish bookcase is the perfect storage and display option for your child. With three adjustable shelves, they'll be able to choose what they want to put in it, from trophies and photographs to books and magazines. The piece is crafted from hardwood solids and ash veneers in a striking graphite finish that, when paired with the silver metal accents, exudes industrial appeal that your kid will love. 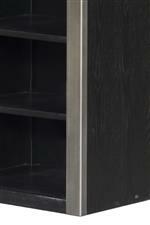 The Graphite 3 Shelf Bookcase by Samuel Lawrence at AHFA in the area. Product availability may vary. Contact us for the most current availability on this product. 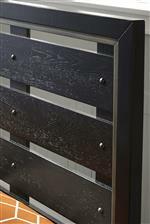 The Graphite collection is a great option if you are looking for Industrial furniture in the area.